Sometimes it is good not to know the truth, but as an administrator you better know what is going on! Most IT pros know that Explorer lies a lot (on a German system C:\Users magically becomes C:\Benutzer), but few are aware that Windows’ permission handling dialog ACL Editor also tends to “pretty up” things. Wow! We suddenly see 8 entries instead of 4! 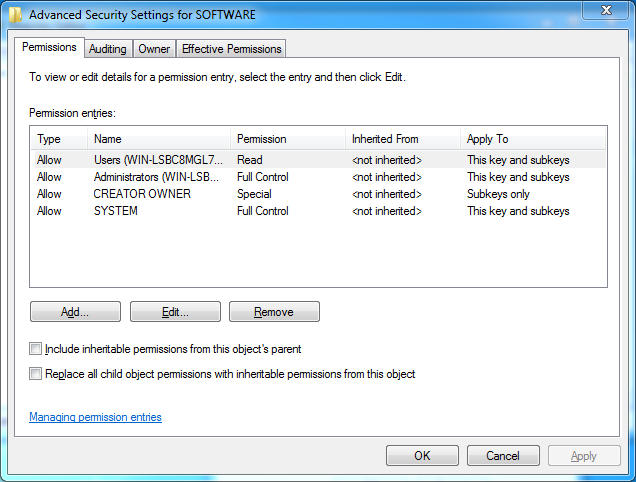 Many default permissions in Windows are configured rather inelegantly, and those set on HKLM\Software are not different. Not only does the Access Control List contain multiple ACE pairs that differ only by their inheritance settings and could be combined into one (e.g. Users and System), it also has one duplicate Access Control Entry (Administrators – full control – this key only). 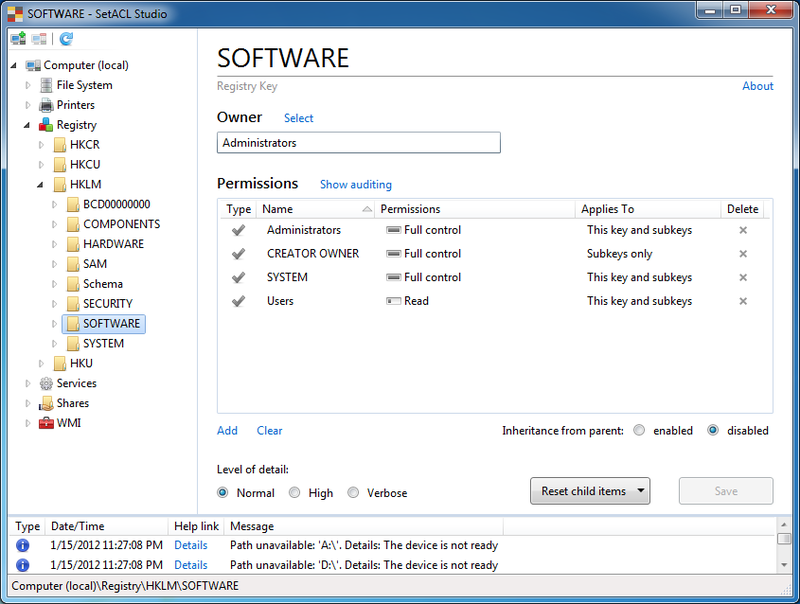 Similar default permissions are used in many places throughout the operating system, just check the ACL of drive C:, for example. 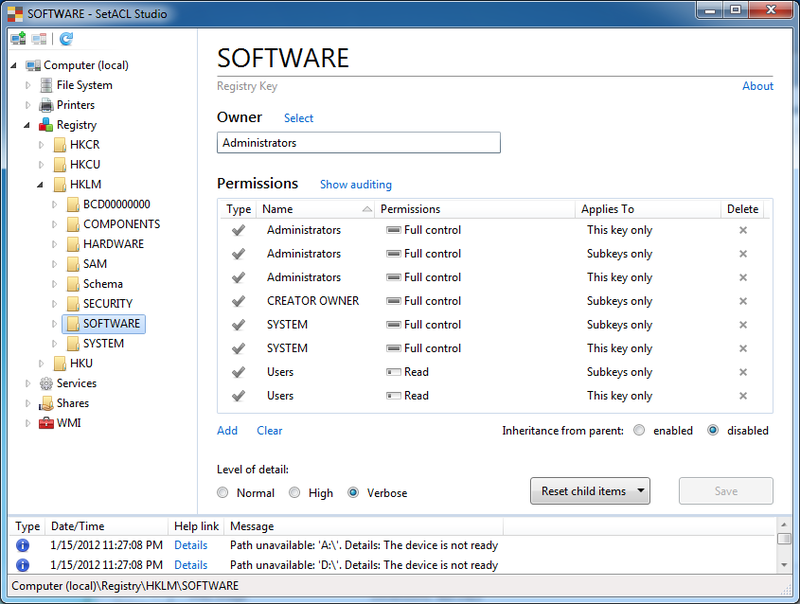 SetACL Studio combines an intuitive user interface with the power of SetACL into a permission management tool that works with the file system, the registry, printers, services, shares and WMI objects. It supports very long paths (the kind Explorer cannot handle) and shows you every corner of the system, regardless of current permissions. Different from most systems management tools, SetACL Studio is extremely easy to use, has a great UI and comes with undo.